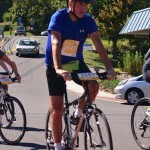 A year ago, riding in a bike marathon seemed like an impossible challenge since I had only ever ridden my bicycle recreationally, had never done anything marathon-like ever before and had not even been an especially athletic child or youth growing up. Now, less than a year later, bike riding through the Northeast of the US to raise funds for the Epilepsy Free not-for-profit and to raise awareness about seizure disorders is becoming a bit of a habit for our team of riders who have joined the team on different rides and myself. I think one of the things that keeps us going is that we recognize that this activity is terribly important. First, it gets a whole community of persons living with seizures, their family, friends, and health professionals to rally around the upcoming event, share links, and offer very necessary financial support to Epilepsy Free. Second, it lets the whole community be loud and vocal about psychogenic non-epileptic seizures (PNES), giving all of us the chance to speak about all sorts of PNES topics and explain why scholarships for adults with PNES are so essential. The funds that are raised, help support educational grants for adults living with PNES who need assistance to continue their education.